I am a boring cook. I don’t feel any particular grief about this. I simply learned many years ago what I like, and how to prepare it, and now am a connoisseur of various combinations of pasta and vegetables. Risotto with asparagus one night, cappellini pomodoro the next, maybe some gnocchi on the weekends. I have a system, and I never go hungry. I also deal with the single person’s shopping dilemma of how not to let food go bad. Cooking for one most of the time prompts some grocery-store handwringing of the “How the heck am I going to eat an entire eggplant?!? !” variety. When I started cooking for my long-distance sweetie on the weekends we could see each other, I was able to branch out a little bit. Together, we can definitely polish off an eggplant. I went through my old cookbooks looking for recipes I’d always wanted to try but of which I never felt like having seven leftover servings. The new world of cooking for two even inspired me get a fall farmshare, with the end result of my frequently showing up to his place with bags of vegetables, homemade tomato sauce and butternut squash bisque. His world of grilling blew my mind a little bit. You mean I have to make a marinade, put it on the mushrooms, and then WAIT? My culinary style is more ‘throw it all in a pot and eat as fast as you can”. The first time we tried potatoes on the grill I felt like I was spinning my wheels. Boiling them half-way through on the stove top before putting them on the grill involved way more dishes than I felt comfortable cleaning. It was a summer evening, though, so we escaped the steam of the kitchen to the porch where we enjoyed a libation and a chat while our potatoes parboiled, then grilled. I don’t remember what else we had that evening, but I remember the satisfaction of opening their tin foil wrapping and seeing something that looked like you might order at a restaurant. I had come a long way from my college days when a friend nicknamed me the “sloppy chef”. It is no longer summer, and using potatoes seems more pressing since I have a bag full of them from the farmshare. This weekend was a weekend “off”, and I only had to cook for one. I woke up Sunday, made half a pot of coffee, and read the paper, which I rarely have time to do. In my former life I would have been thrilled for a morning of silence and solitude, but my habits have morphed now and I have learned to be lonely. I finished the paper and most of my coffee and was hungry. I thought about going out to get something, but it was cold and I was feeling frugal. I wanted potatoes, and thought with an inner sigh of our favorite breakfast place with delicious home fries. Sad and directionless, I felt like even more of a loser for letting a Sunday alone vex me. 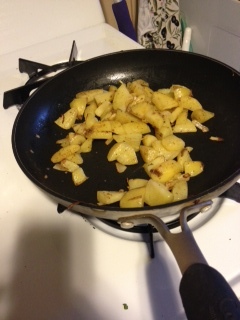 Even though it was going to use two pans, I started prepping home fries for one. I reached into my burgeoning potato bag and pulled out a few tubers as the water boiled. Peeled and chopped, they began their bath and I put some butter and onions in the saucepan. Without thinking I had prepped a few more than I should have. After just a few moments in the water they hit the strainer (yet another item to wash!) and made their way into the pan in which clear onions simmered. Not long after that I sat down in the quiet with a plate of breakfast potatoes, happy with my accomplishment but still surprised at my own loneliness. My first solo home fries were just the right consistency – the potato version of “al dente”. Parboiling, new to my vocabulary, would once have been an affront to my erstwhile cooking-for-one efficiency. I’m still learning that trying something new and wonderful might require a little softening first. Hey,you want an easier way to pre-cook potatoes for frying, etc? wash, don’t peel. Stick them like you would for baked and pop them (still kind of wet, or put a wet paper towel over them) into the microwave for 3-5 minutes.